Electroplated diamond grinding discs are ideally used for grinding hard materials including ceramics, composites, and many others. We can custom make any special designs according to your drawings and specific requirements. 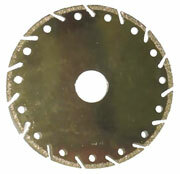 Electroplated diamond grinding & cutting blades are mostly custom made. For more information please contact us. Other designs and specifications of electroplated diamond grinding discs and electroplated diamond grinding & cutting blades are also available upon request.